Lynwood, pop. 66,000, is 5 miles south of downtown Los Angeles. It may be possible to completely ignore a Lynwood ticket. 1. The LA County Superior Court does not report ignored red light camera tickets to the DMV. More info is in "Countywide Information," which is Docs Set # 2 on the LA County Documents page. 2015 - 2017: Is a Refund Needed? See Set # 5, below. Aug. 15, 2017: Program Ended - see Set # 4, below. In April 2009 the City sent me some tables showing the money it received from the court, and the disposition of the tickets. These annual totals, or annual projections, are by highwayrobbery.net. The 2017 citations total was estimated based upon the Jan. - Aug. fine revenue. 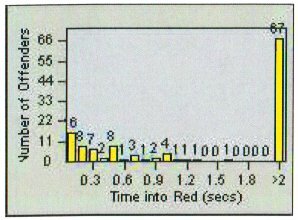 Any figures in red type (or, if you are looking at this table in black and white, the upper figure when there are two or more figures in a cell) are what RedFlex calls Total Violations, or all incidents recorded by the cameras, and due to time limitations may have been posted only for selected months or locations. If there is sufficient public interest, the remaining months will be posted. The figures in black type are what RedFlex calls Notices Printed, and represent the sum of genuine citations issued (those filed with the court) plus any Nominations mailed (not filed with the court, a.k.a. Snitch Tickets). Figures in blue type (or, if you are looking at this table in black and white, in italic type) are total Cites Issued (filed with the court), per RedFlex's monthly invoices to the City. Data was received on 9-7-12. Intersection-by-intersection data will be posted to this table as time permits. The official documents are available at the link above. Data for these months was requested on 2-28-17. As of 8-11-17 there has been no response. The City receives approx. $150 of the (approx.) $500 fine - if it is paid in full. For source of fine revenue figures, see Set # 6, below. In the report for this month, there was a quantity of incidents noted as "in progress," so the eventual total Notices Printed will be higher than the figure entered in the table above. The 2016 annual totals were found in the staff report for the 8-15-17 city council meeting, available at link in Set # 4, below. Data for these months was requested on on 7-6-17. As of 8-11-17 there has been no response. An official report showed that in 2014, 83% of the City's tickets were for turns, mostly right turns. The City provided bar graphs of Late Times, etcetera, for its camera. 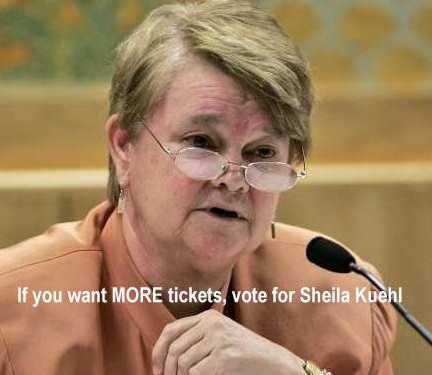 The Contract - Paying Too Much, So Issue More Tickets! Lynwood held the required public hearing on Dec. 16, 2003, considered a staff report, and on Dec. 18 (two weeks before the effective date of CVC 21455.5(g)), signed a pay-per-ticket contract with RedFlex. "RedFlex will be paid $89 for the first three Citations issued on a single day from a particular Designated Intersection. RedFlex will be paid $80 for the fourth and subsequent Citations issued on a single day from a particular Designated Intersection." On Dec. 18, 2008 the City Council considered a staff report and then approved a new five-year contract including an illegal "cost neutrality" clause, whereby the city did not have to pay RedFlex the full rent if there wasn't enough fine revenue to cover the cost. See Subsection B. of Defect # 10. The 2008 contract penalized the City should it choose not to enforce right-hand turn violations. That contract also said: "Definitions. 'Warning Period' means a period after the Installation Date of the first intersection approach..." (Emphasis added.) See Defect # 6. The 2008 contract set the monthly fee per existing camera at $5000. Had the council negotiated a $2900 fee like that in the 2007 contract of the City of Garden Grove, it could have saved $2100 per camera per month, or $252,000 for the two cameras over the 60 months of the contract. To see what other cities pay, go to FAQ # 17. On the council agenda for Oct. 1, 2013 there was a staff request for the council to "provide direction" about the possible extension of the contract. The minutes indicate that accident statistics were presented, but the City lost all copies of those presentations. The council asked for the item to be brought back, at a later meeting, with a detailed analysis. The staff report also revealed that after some negotiation, RedFlex had provided the City a "Cost Neutrality Clause Repayment" of $28,242. In March 2014 the City of Elk Grove, California approved a new contract which specified the following rents for their five RedFlex cameras. Because Lynwood did not negotiate for a similar schedule of rents, the City will pay 59% too much over the three years, $100,800 extra based on a target price of $2000. To cover that extra rent, the City will need to issue an extra 3054 tickets (in 2014 the City's fine revenue averaged $33 for each ticket it issued). Lynwood's new contract of 2014 does not contain an escape clause - a way for the city council to end the program before the three years is up. 1. Safety is the whole reason to operate red light cameras, but there's no discussion of it in the staff report. Is the 2017 process to be a repeat of what happened in 2013 - 2014, when the safety presentation was last minute, during the meeting, with all record of it disappearing afterward? Now - before a new four-year contract is signed - the council should be provided with a report about whether the cameras actually improve safety. That report should also include details of the engineering changes staff may have made to improve safety - for example, has there been a discussion of using blank out signs to stop the rolling right turns? The following information raises further questions about the safety effect of Lynwood's cameras. a. Ticketing has tripled since 2014.
has been reporting that it has no "before" accident data. c. Consider the comments from officials in other LA area cities. The proposed contract extension was on the agenda for Aug. 15, 2017 and the vote was 3 - 2 to not renew, with Castro and Santillan-Beas voting for renewal. Most likely the last day of monitoring will be Aug. 31. This list of contracts and amendments was up-to-date as of Aug. 11, 2017. Due to a statewide rule change, beginning Aug. 1, 2015 the yellow lights at red light camera intersections in California must be set according to the 85th Percentile Speed as determined by an Engineering and Traffic Survey of the street (ETS or, colloquially, a radar speed survey) or, if no ETS is available, according to the posted speed limit plus 7 mph. [See Defect # 2, on the Home page.] On July 18, 2016 we sent the City a public records request for "The current radar speed surveys...," and on Feb. 23, 2017 City staff replied, "The City does not possess any... radar speed surveys." Because there is no current ETS, we used Imperial Highway's posted speed of 40 mph to look up the required yellow in the applicable table in the Caltrans Manual (MUTCD), and it requires a minimum yellow of 4.4 seconds. Per a "current" signal timing chart City staff sent to us on Feb. 23, 2017, the yellow for westbound traffic on Imperial at Atlantic Avenue has been set at 4.0 seconds since 2013, and on Feb. 28, 2017 we personally made a video of that signal in operation and confirmed it was set at 4.0 seconds. Please refund the red light camera tickets issued after Aug. 1, 2015 by the Imperial/Atlantic camera. The City's monthly ticket revenue from the court is available in the Revenue Spreadsheet on the LA County Docs page.